The right of issueing academic degrees used to be held by the Hungarian Academy of Sciences. At that time the Scientific Evaluation Committee awarded scientists the Russion-type degree, the Candidate of Sciences (CSc). This degree was unknown and thus not accepted in most countries of the world. 2 decades ago The Act of Higher Education, 1993, charged universities with preparing students for their academic degree as well as awarding them doctoral (Ph.D.) degrees. This decision galvanized the scientific communities and schools of doctoral studies were founded one after the other in all Hungarian universities. The former Semmelweis University of Medicine was not an exception. Professor Péter Sótonyi laid down the basic foundations of the SOTE Doctoral School. His successors, Professor László Kopper, Professor Ágoston Szél, Professor Károly Rácz continuously re-organized it, carefully structuring the study programs, creating and amending the detailed regulations and working out new rules of the institution. The Doctoral School of Semmelweis University is currently one of our most successful divisions with around hundred students obtaining their Ph.D. diplomas every year. The School of Ph.D. Studies is in fact a “virtual” organisation of the university, in importance comparable to that of a Faculty. The virtuality of this “Faculty” is due to the fact that teachers and tutors are all employees or co-workers of the five official Faculties, they perfom their scientific activities in different laboratories and institutes of this (and other) universities. However, with their collaboration and organization they create new research centers that function like spiritual “melting pots”. The concentration and focus of this scientific potential has a great impact on the young candidates’ research work. The motivation of the students is multiplied by the presence and interaction of experienced tutors. The basic unit of this complex teaching-learning team is one student – one tutor. Together they enjoy a high level of freedom and autonomy in running their research, naturally, within the limits set by the rules and regulations. Currently the School of Ph.D. Studies of Semmelweis University has 7 Doctoral Schools. Basic Medicine, Clinical Medicine, Pharmaceutical Sciences, Mental Health Sciences, Neurosciences, Molecular Medicine and Pathological Sciences. Each School comprise 2 to 17 study programs, the total number of which is above 40 (see detailed information on programs and Doctoral Schools). It is important to mention that the Doctoral School of Semmelweis University integrates the research groups and programs of all Faculties entitled to issue Ph.D. degrees.. By involving the greatest authorities from within, as well as from outside the university, the School of Ph.D. Studies has from the beginning been able to preserve the quality and prestige of the degree. Although the educational and qualification phases can be continuous, each contains features that provide greater flexibility in obtaining a degree. Basically, anybody holding a university diploma (not necessarily a medical one) can join either Phase I or II. The aim of Phase I is to train students to become scientists by providing them courses. Credit points can be accumulated upon completion of a course. The selected scientific topic will become the core of the thesis. Research is usually conducted in laboratories in collaboration with faculty members. A qualified tutor supervises each student. Phase II provides an opportunity to evaluate the results of the experiments and to publish them in acknowledged scientific journals. Obviously, this is, or can be an on-going activity in Phase I as well. The student is required to pass a comprehensive examination and to write and defend a dissertation. Phase II follows Phase I, but one may join Phase II without completing Phase I, providing the necessary prerequisites have been fulfilled. However, if one joins the School of Ph.D. Studies directly in Phase II it is necessary to be accepted by a tutor/consultant within a program. Both full-time and part-time students must meet the same requirements. The main difference between those with and without scholarship is that the latter have jobs and are combining studies and work. Individuals who join only Phase II will not be students with record-book and student identity card, but they will be candidates for the doctoral degree. The aim of Phase I is to train students to become scientists by providing them courses. Credit points can be accumulated upon completion of a course. The selected scientific topic will become the core of the thesis. Research is usually conducted in laboratories in collaboration with faculty members. A qualified tutor supervises each student.At mid -term after 24 months a comprehensive complex (theoretical and practical) exam is supposed to be taken by the student. Phase II provides an opportunity to evaluate the results of the experiments and to publish them in acknowledged scientific journals. Obviously, this is, or can be an on-going activity in Phase I as well. The student is required to write and defend a dissertation. Both full-time and part-time students must meet the same requirements. The main difference between those with and without scholarship is that the latter have jobs and are combining studies and work. The actual decision-making body of the School of Ph.D. Studies is the Doctoral Council. Its work is supported by the Educational and Credit Committee and Quality Control and Evaluation Committee. The former is responsible for organizing the study courses and all matters related to the training. The latter evaluates topic accreditation applications, dissertations prior to submitting them to opponents. Disciplinary Committee has been established to run disciplinary procedures.and Inernational Committee coordinates international matters of the Doctoral School. The Doctoral School is an autonomous educational body of the University; it functions as subject to the decisions made by Doctoral Council that meets regularly about every second month of the academic year. The work of the Doctoral Council is supported by the Doctoral Office. 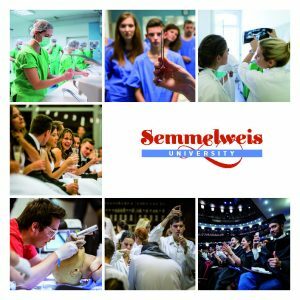 The Doctoral School of Semmelweis University includes seven scientific (departmental) doctoral schools that manage the educational programmes, sub-programmes and offer the research topics which are the most important for PhD students. (5) the recognition of credit points. Students receiving tuition are advised to choose those courses which are promoted by the Doctoral Council of Semmelweis University. Theoretical knowledge and skills necessary for research are obtained from the compulsory course modules. Throughout the year the departmental doctoral schools organise optional courses. Some of them organise courses which are obligatory for all the students who are registered in that particular school. The efficiency of the doctoral training is shown in the frequency of completed doctoral theses and academic publications. The standards of these works are judged by scientometric indicators. This process evaluates both the academic competence of individual PhD candidates and also the academic standards of the Doctoral School. One of the most important acts of quality control is that everybody involved in the process complies with the instructions given in the qualification phase by the Doctoral Council (DC). The importance of this issue led to the establishment of The Quality Control Evaluation Board. This first evaluating forum controls whether the submitted work fulfils the conceptual, structural and formal requirements of a doctoral thesis. Consequently a formal opinion is released stating whether the PhD candidate acquired the scientometric indicators prescribed in the Book of Regulations of the Doctoral School or not. Considering the proposals given by the QCEB the Doctoral Council decides whether the doctoral thesis can be sent to the opponents. At a first glance this process might seem unnecessary because the control of requirements looks like a simple administrative issue. However, the process of evaluation described above – which applies the general rules (sometimes with a great deal of empathy) – is highly desirable for a number of reasons: there is a great variety of research topics, the issues discussed range from molecular biology to behavioural sciences which must be able to win academic recognition in Hungary and abroad. Only those candidates deserve scientific degrees who are able to publish their results intelligibly and based on a coherent analysis.. Some articles which were published in magazines abroad with a sophisticated title and impact factor are not sufficient to create basis for PhD qualification. Only those articles can hope for recognition which are the result of real academic work. Therefore articles summarising the academic literature of a particular topic or commenting on the academic work of others as letters to the editor are not acceptable. By contrast, articles published in a magazine under the latter heading could include original scientific results. But this must become clear from the presentation of scientific methods and/or from the editors professional opinion. The QCEB during its evaluation takes into consideration the grammatical correctness and style of the English or Hungarian language, the length, the external appearance of the thesis and the quality of illustrations. These examples illustrate that the board has a high level of responsibility in defining the academic quality of PhD qualifications. At the same time the board is meticulously tactful in giving criticisms. Therefore written judgments also include constructive suggestions for correcting the deficiencies discovered. This professional opinion is sent to both the candidate and the head of the training programme. This process creates grounds for the necessary corrections and gives the possibility of legal remedies. One of the major duties of the QCEB is to report its experience to the Doctoral Council and to suggest proposals concerning the alterations in the Rules of the Doctoral School if necessary. Apart from the duties described above the QCRB has authority over any stage of the doctoral procedure in scientific matters. Furthermore, it passes judgements on applications, looks into the matters of complaints and makes decisions concerning naturalisations (e.g. the recognition of qualifications). The administrative duties of the Doctoral School are managed by the Doctoral Office which creates a link between the Doctoral Council, the PhD training programmes and the PhD students. It maintains permanent contact with the educational bodies outside of the university (e.g. governmental authorities, Hungarian Accreditation Board, etc.). The PhD training programme provides opportunities for every candidate to acquire practical knowledge of the methodology of presenting results gained in scientific research. PhD students therefore are required to present their work regularly both among fellow workers and in a wider professional environment. The need for an overall PhD conference of the Doctoral School was promoted even though the departmental doctoral schools organise scientific forums for their own PhD students. The prime objective was that participants would be able to familiarise themselves with the scientific work of each programme. At the conference lectures and poster presentations are given. On every occasion PhD students and candidates have the opportunity to present their work in sections with a jury. Candidates with works of a high standard gain awards in each section. All the conferences are highly successful. PhD students participate from partner universities in Budapest and in the provinces. Every semester there are a number of courses (60-120) announced on the website. The Doctoral Council of the Semmelweis University took into consideration the views the Educational Board and restricted the number of courses which can be run by each departmental doctoral school in one semester to between five and seven. Since then the following procedure has been established concerning PhD courses, i.e. the Doctoral Committee of each Departmental Doctoral School proposes between five and seven courses at the beginning of each semester which are entered the database of current courses. However, the Educational Board can recognise and award credit points for participation in PhD courses of the appropriate standard at other universities. In this case the Educational Board needs the recommendation of the tutor and the head of the departmental doctoral school of the student in question. The list of courses, which have to be taken during the PhD training period, is finalised.The database of available courses is accessible at the website of the Doctoral School. Consequently, students are able to access the database and construct their own individual study plan. Doctoral applicants must be university graduates or students registered for the last semester of their studies at the university. Applicants are required to indicate on the application form the training programme and research topic selected inside a Departmental Doctoral School. The Doctoral council determines the content of the PhD programmes, the admission procedures and the admission fee. The Doctoral Secretariat Office provides detailed information about these to the applicants. Applicants can be admitted to the educational phase (with state grants, private scholarships and fee based education) or to the qualification phase (PhD examination, writing and defending a thesis) of the doctoral training. his/her special (topic related) knowledge and academic competence. Hundreds of PhD students take the courses as part of more than fourty training programmes of eightseven doctoral schools under the supervision of hundreds of tutors in different locations. Every half year the school organises 60 – 120 courses; the lectures and seminars are given in more than 50 locations within the university. There are great advantages stemming from the intensity and variety of our education system. Therefore, it is a high priority to publish information which is clear-cut and accessible by everybody. The gradual augmentation of the website has led to the accumulation of information about every training programme and sub-programme and of every teacher and doctoral defence since 2000. Importantly, the website provides information about on-going courses and application possibilities. All application forms and documents, which are necessary for the administration of doctoral matters and the resolutions of the Doctoral Council, are also accessible on the website. Other detailed information and curricula are also available electronically. The website provides addresses, telephone numbers and e-mail addresses, and links to important academic and PhD program-linked websites. The database system of presenting doctoral thesis on the internet was set up (www.doktori.hu ) The number of accessible doctoral theses and synopses increases on a day to day basis. It is required that doctoral theses be available to the public before the defence so they may be accessed electronically in full through the internet simultaneously with the announcement of the PhD defence.